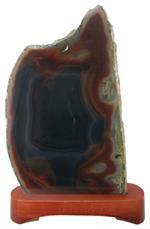 Item #AM-PL-AG-200-C: Approximately 11"x8" tall Agate Slice (Brazil) on wooden base. Item #MS-763: Approximately 6"x6.75" Agate slice (Brazil). Item #MS-810: Approximately 5.5"x6.75" Agate slice (Brazil). Item #MS-818: Approximately 10.25"x6.75" tall Agate Slice of 1 lb. Item #AM-AG-50: Average approximately 5.75"x9" - 6.5"x10.25" Agate Slice (Brazil). 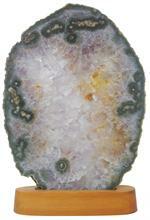 Item #MS-823: Approximately 7.5"x7" tall Agate Slice (Brazil). Item #MS-826: Approximately 8"x4.25" tall Agate Slice (Brazil). Item #MS-827: Approximately 8.25"x6" tall Agate Slice (Brazil). Item #MS-829: Approximately 11.5"x8.5" tall Agate Slice. 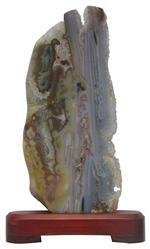 Item #MS-830: Approximately 9"x8" tall Agate Slice of 1.35 lbs. 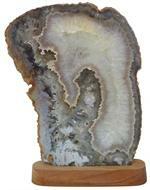 Item #MS-758: Approximately 5.25"x7.5" tall Agate Slice (Brazil) on wooden base. Item #AM-AG-SL-110: Approximately 6.25"x5.25" tall Agate Slice (Brazil) on wooden base. 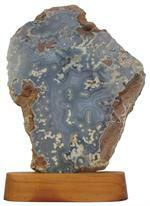 Item #AM-PL-AG-200-A: Approximately 8"x12" tall Agate Slice (Brazil) on wooden base. 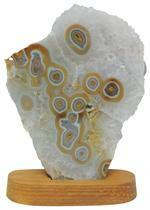 Item #AM-AG-SL-50: Approximately 4.75"x7.75" tall Agate Slice on wooden stand. Item #AM-AG-SL-129: Approximately 5"x12.5" tall Agate slice on wooden stand. Item #AM-BAS-125: Approximately 5.5"x7.5" tall Agate Slice (Brazil) on wooden stand. Item #AM-BAS-75: Approximately 4"x10" tall Agate Slice (Brazil) on wooden stand. 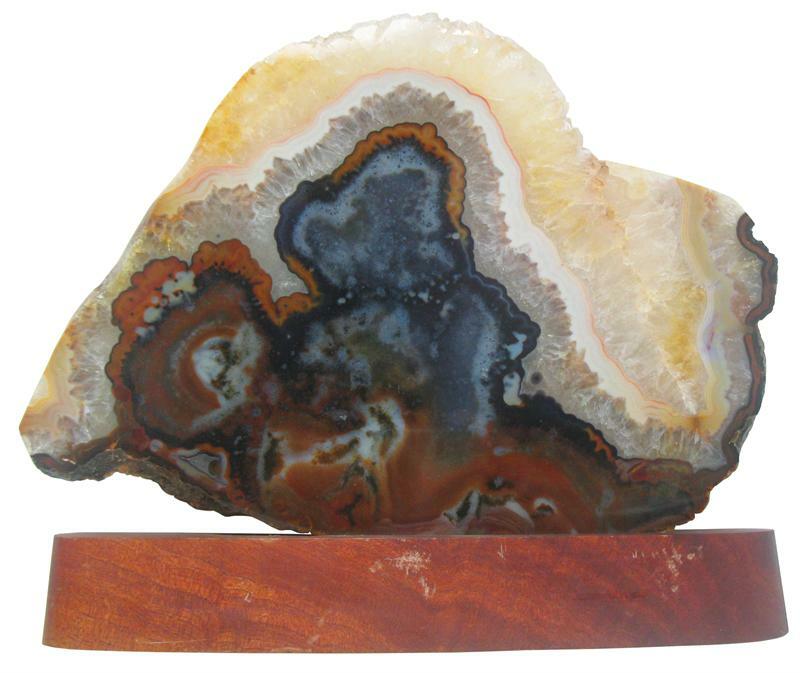 Item #AM-AG-125: Approximately 7.75"x10.5" tall Agate Slice on wooden stand. Item #BAS-DYD-5: Avg. 7/8" thick, 5" wide dyed Brazilian Agate slice. Available in dyed blue or dyed purple. Item #MS-781: 30x47mm polished Kentucky Agate slice of 44.97 cts. Item #VO-AGKC-25: Agate Slice (natural & dyed) key chains. 10 pieces. Item #VO-TAS-25: 1 1/4" - 2 1/4' long thin Agate slices (natural & dyed). 25 pieces.